She has teddy bear & star shaped sandwiches and koala cookies on the left. 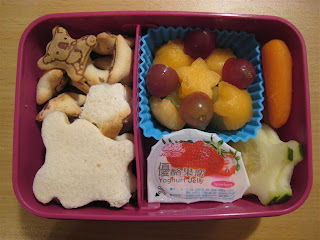 On the right, she has star shaped canteloupe, grapes and honeydew, some carrots, teddy bear shaped cucumber and a yogurt jelly. All yummy & Faith chosen. Hi. I've been reading your blog for a while and love it. I love how creative you are. I was wondering if you could let me know where you get all the shapes for the cutouts you use for the sandwiches and cucumbers, etc. Thank you!! Where do you get your yogurt jelly? I looked at the asian market in Plano but they didn't know what I was talking about.